The terms "Sunni" and "Shia" (also spelled "Shi'a" or "Shi'ah") have flooded American media outlets since the 2003 U.S. invasion of Iraq. Pundits describe the Sunni and Shia as being two branches of Islam who are at odds with one another in Iraq and other parts of the Middle East. In order to properly understand Sunni and Shia relations, one must first learn how Islam splintered into two sects. During the prophet Muhammad's lifetime, Islam was a largely unified faith. When Muhammad died in 632 A.D., he left no sons and thus there was some question over who would succeed him. A council was held and the Muslim community elected Abu Bakr as caliph or leader. Those who believe that Abu Bakr's election as caliph was legitimate are known as Sunnis. Muslims who maintain that Muhammad named his cousin and son-in-law, Ali, as his successor are known as Shia (literally "party of Ali"). The Shia believe that Ali, not Abu Bakr, deserved to be the first caliph. Eventually Ali became the fourth caliph, almost 25 years following the death of Muhammad. 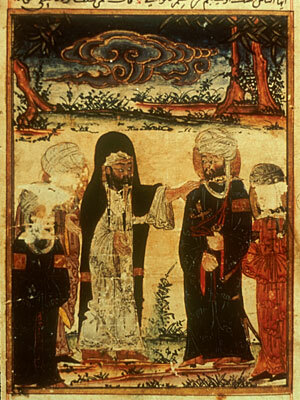 Muhammad's supposed appointment of Ali as his successor. Relations between Sunni and Shia have oscillated over time between amicability and hostility, peace and war. Sunni have always been a majority of the Muslim population and currently represent approximately 90% of Muslims globally. It is no surprise that the Shia have come to stress taqiyya as a result of periods of persecution. Currently the 10% of the Muslim population who identifies as Shia is concentrated heavily in Iran (approximately 90% Shia), Iraq, and Yemen. While many Muslims identify themselves as either Sunni or Shia (or sub-sects of each), a sizable number of the Islamic faith identify themselves first and foremost as "Muslim." One might argue that the fundamental beliefs shared by the two sects are more significant than the differences. So the next time you are watching CNN and Anderson Cooper says "Sunni and Shia" and your Uncle Butch blurts out, "What the hell's the difference anyway?" you can drop some knowledge on him; or just smile coyly and shrug.